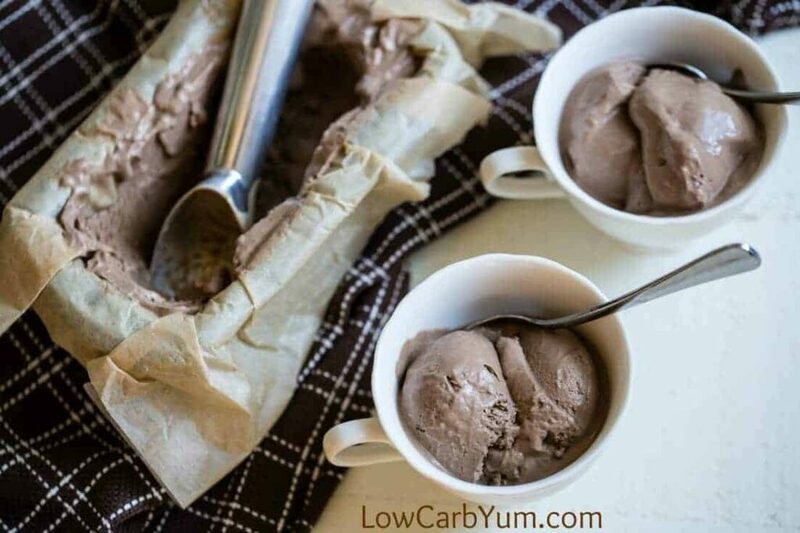 Are you looking for a keto chocolate dairy free ice cream recipe that’s simple and delicious? 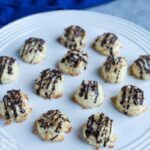 Here’s an easy low carb coconut cream based recipe using only 5 ingredients. There seems to be a lot more people discovering they have sensitivities to products made with cow milk. I’ve tried a few goat milk products and even raw milk. However, it’s impossible to find either of them sold as cream in my area. I suppose you could skim the fat off the raw milk to make your own cream, but not sure if I want to do that. One of my biggest weaknesses is ice cream. So, if I’m going to cut back on dairy products, I’ve got to find some low carb cream substitutes. Coconut cream seems to be the best alternative. My favorite brand is LC Foods because it has the lowest carb count. 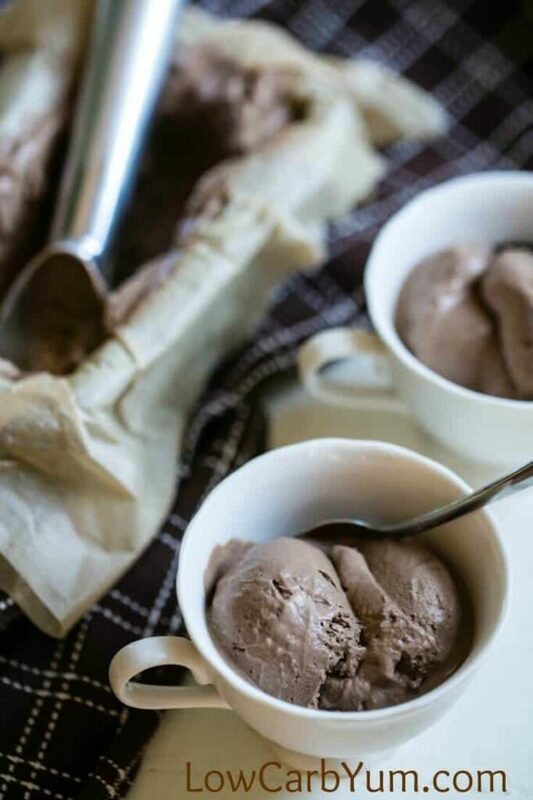 I use it in this chocolate dairy free ice cream recipe. You may be wondering why those who have no known sensitivities to dairy have decided to eliminate it. I ended up researching the dairy product debate and posted the results on All Natural Ideas. And, while investigating, I found many benefits of going dairy-free which you can view here. After reading up on reasons why dairy may be bad, I figured I better start working on more dairy-free ice cream recipes. 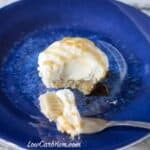 Wanting to start out simple, I came up with this keto ice cream recipe. To make it, you’ll only need five ingredients. The key ingredient for my chocolate dairy free ice cream recipe is coconut cream. 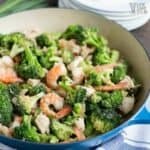 You can certainly make your own by taking the solid fat part of a can of coconut milk. However, I like to just buy the higher fat low carb coconut cream that’s available in a can. Be sure you read the label before buying it as carb counts can vary. 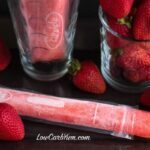 The LC Foods brand has only 1g total carb per 1/3 cup serving. Egg yolks are added to make the frozen treat rich and creamy. And, they also act as a stabilizer which prevents the formation of ice crystals. Using egg yolks as a stabilzer means it will last longer in your freezer. Of course, I never have to worry about that since it’s eaten well before that! 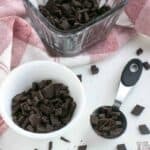 You can use any unsweetened cocoa powder you’d like. Lately, I’ve been using the Dutch processed cocoa made by NuNaturals. In fact, NuNaturals send me a package of their products to try and I’ve been testing them out over the last few months. I’m hoping to put together a review soon. It’s going to be difficult for me to go completely dairy free. But, taking baby steps to cut back a little at a time may get me there. It will just be a longer process. I’m not sure what people do if they have tree nut allergies and can’t tolerate either almond or coconut milk. Going dairy-free would be a lot harder. While the coconut cream based dairy free ice cream was processing in the machine, I was busy catching up on the blog. 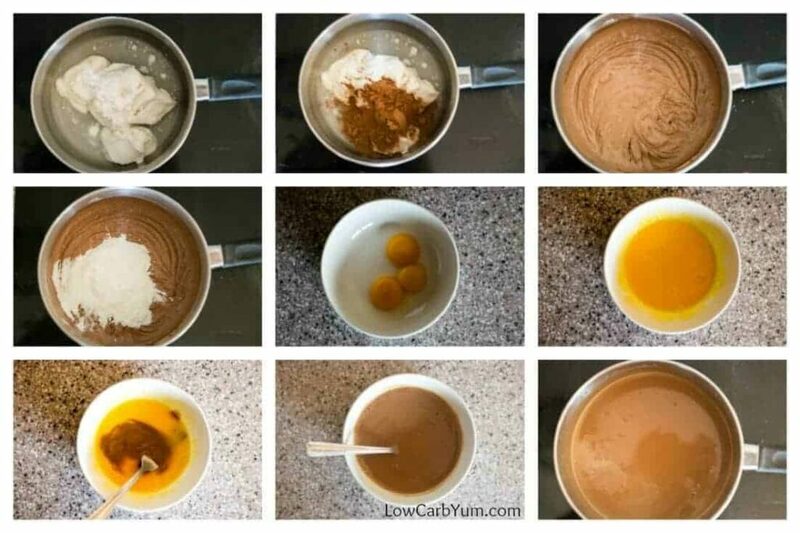 The mixture ended up being processed longer than needed. When I finally got to it, it was a nice soft serve texture. I couldn’t help myself from taking a large sample. It tasted great! Since this was a test batch, it made a fairly small amount. I ended up with five large scoops of ice cream. The whole mixture just fit into a mini loaf pan lined in parchment. That was after my little sampling of finished product. Next time, I’ll make a double batch. I may also try using one can of coconut cream with one can of regular coconut milk. Many of the homemade ice creams I’ve made in the past mixed cream with whole milk. 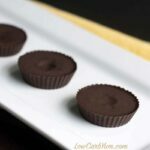 So, it may be okay to do something similar using dairy-free coconut products. 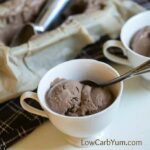 I found this chocolate dairy free ice cream recipe was best served before completely freezing in the freezer. If you let the ice cream completely freeze, it does become hard and unscoopable. 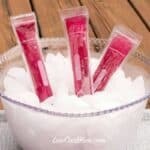 But, letting it thaw slightly at room temperature will allow you to easily scoop it out. 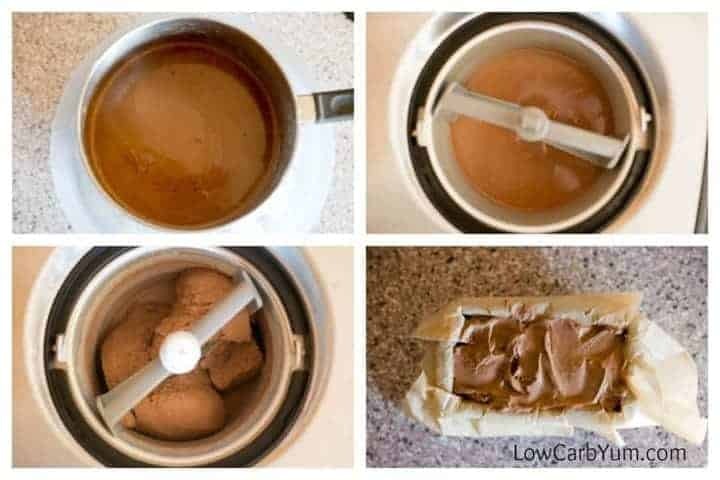 For those of you who hate having to let the whole container thaw each time you want a serving of low carb ice cream, I’ve found a solution. 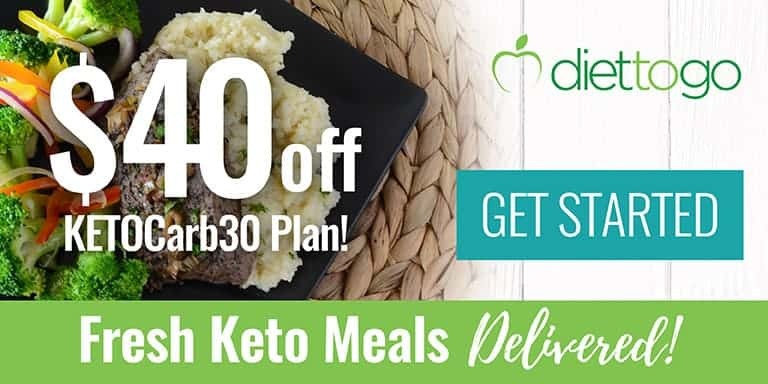 Simply freeze it in single serving containers. The mini tubs made by Tovolo are perfect for freezing in smaller amounts. That way, you only thaw what you’ll be eating! 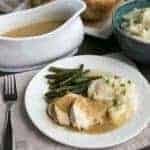 You can bet this recipe will be a regular at my house. 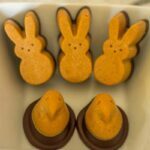 I’ve already ordered smaller freezer containers so I can keep a supply of it in the freezer for quick treats. You could add a little whipped coconut cream to the top if you wish, but I don’t feel it’s needed. 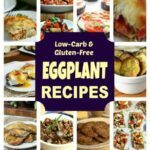 Have you been following a low carb dairy free diet? 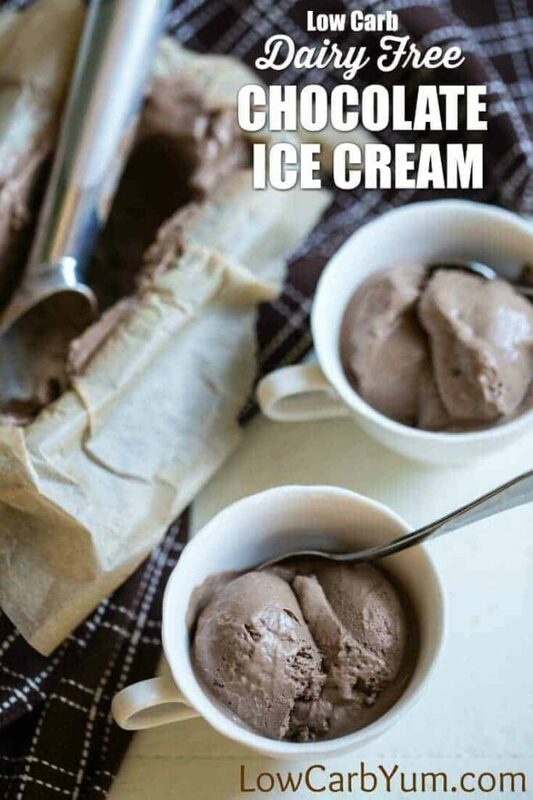 Even if you aren’t, you should give this dairy ice cream recipe a try! 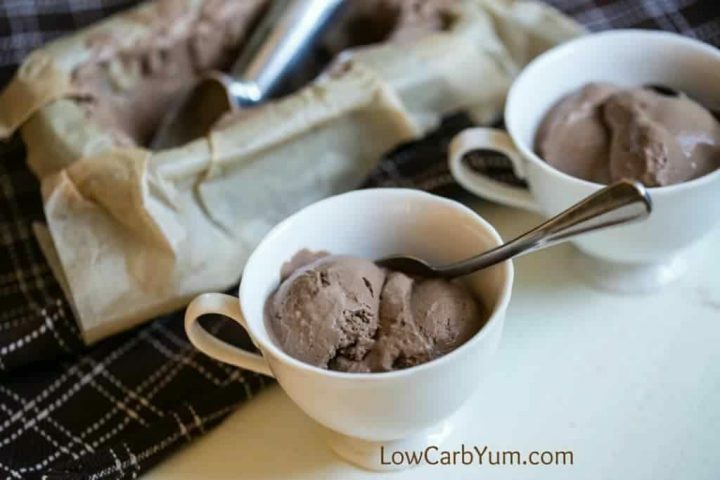 Are you looking for a dairy free chocolate ice cream with no sugar added? 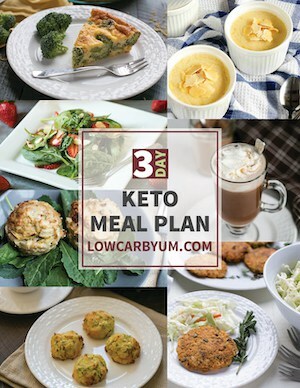 Here's a simple low carb coconut cream based recipe using only 5 ingredients. Whisk together coconut cream, cocoa, and sweetener in a medium saucepan. Heat on medium heat until heated throughout. Whisk yolks together in small bowl. Slowly stream about 1/3-1/2 of the heated cocoa mixture into yolks while whisking in. Return all the egg mixture to pot and continue heating on medium heat until thickened. Stir in vanilla extract. Cool mixture in ice bath. Once cooled, process in ice cream machine.